Do you fancy making Japanese food at home but you’re not quite sure where to start? If the idea appeals, invest in the best sushi rice cooker and racking up those California rolls will be an absolute cakewalk. We rigorously tested a bunch of the best models on the market and we’ve curated them to just 5 of the very finest. Before pushing on, we’d like to make clear we have no particular allegiance to Zojirushi. You’ll see from the rest of our site that we usually avoid reviewing multiple models from the same brand. In the case of rice cookers, though, this manufacturer stands head and shoulders above the opposition. An example of fuzzy logic rice cooking at its most elevated, this 3-cup model is not exactly cheap but it might be the smartest investment you make this year. Load up the cooker with sticky rice and sit back as the triple heater returns perfectly even results every time. While the Neuro is no looker, in terms of performance it’s elevated above much of the competition. 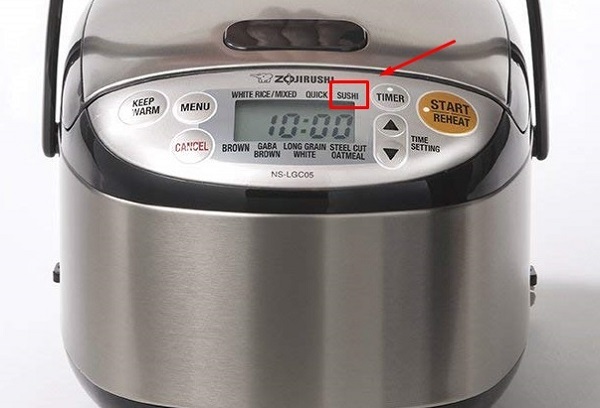 You’ll get a full 20 cups of cooked rice from this beast, a generous spread of settings and fuzzy logic to save you time and effort while making your life easier. 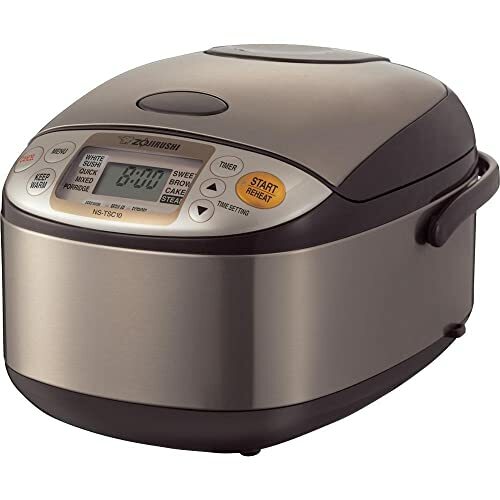 If you’ve got deep pockets and immaculate taste, this 5-cup induction heating system pressure rice cooker is well worth the considerable investment. You’ll be spoiled for choice with rice varieties and functionality is first-class. 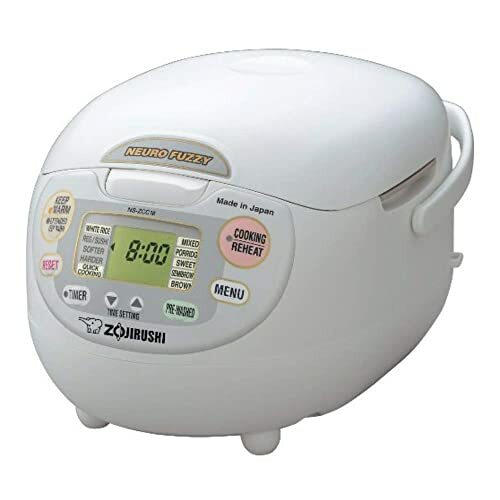 The cooker is also super-simple to use so this Zojirushi is a winner across the board if you can afford it. If you want to make sushi at home, perfectly cooked rice is the foundation. Sure, you could cook this by hand. 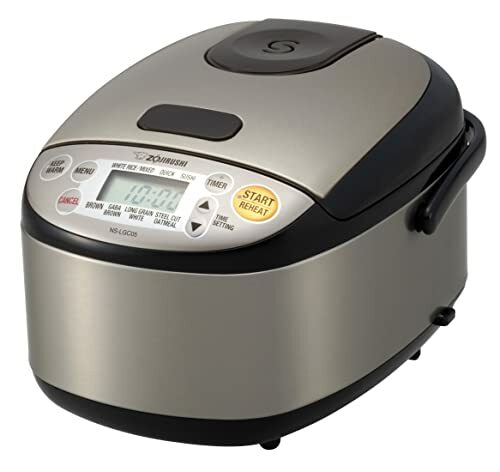 A rice cooker, though, gives you consistency and standout taste with almost no effort. Luckily, many models are eminently suitable for preparing the type of rice you need for sushi so what should you look out for on the buying trail? If you’re looking for general guidance on rice cookers, we collated some comprehensive FAQs right here. That aside, you’ll have a wide choice of rice cookers at your disposal. How, then, can you make this type of rice in your new appliance? Note: 1 cup of Japanese rice is equal to 0.85 cups of rice using the American system. We’ve adjusted this for you but here’s a handy conversion tool for future reference. Do not under any circumstances try to sidestep this part of the equation. Time spent here will be rewarded when you tuck into your sushi later. Now comes the part specific to rice for sushi. Now you’re done and ready to make your favorite creations! 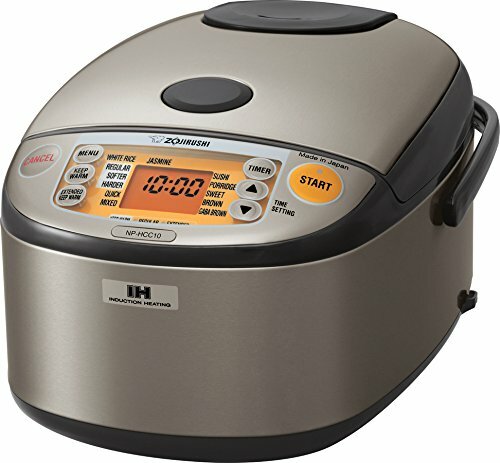 If you’ve wondered what on earth fuzzy logic is, it simply means the rice cooker packs a small computer that makes adjustments on your behalf while the rice is cooking giving you the perfect finish every single time. The triple heater on this model delivers even results and you can make up to 3 cups in a single sitting. This should be more than enough for a small family since uncooked rice tends to double up in volume when cooked. With a spatula, holder and rice measuring cup thrown in, you’ve got all you need for great sushi except the sticky rice! Another rock-solid fuzzy logic model from Zojirushi, the Neuro might look like a child’s toy but functionality is first-rate. You’ll get a robust 10-cup capacity with a full suite of settings from a range of white rice for sushi through to various semi-brown and brown variants. Remember, too, that rice volume doubles when cooked so the Neuro will allow you to make sushi for the largest dinner party fuss-free. The oversized display is easy to read while the menu is straightforward to navigate. The only real gripe we have is the questionable design but that’s subjective. What’s very much objective is that you’ll get outstanding rice for your sushi in high volume. That, after all is what counts. While this induction heating model from Zojirushi is not cheap, it kicks like a mule and provides you with a secret weapon for making the best sushi imaginable. From the platinum particles baked into the non-stick coating through to advanced fuzzy logic and umami and steam-reduction settings, attention to detail extends throughout. You’ll be able to cook 5 cups of rice with the smaller model and this comes in a compact form ideal for smaller kitchens. Warming, heating and reheating are all a cinch and you’ll be able to rustle up just about any type of rice with the minimum of fanfare. A less expensive and more basic model but one that won’t stiff you on the performance front, this 5 ½-cup unit lacks a sushi water line indicator but in all other respects delivers fully. You’ll get Zojirushi’s intelligent fuzzy logic to do all the hard work for you and an array of settings catering for everything from sushi rice to cakes. Design is sleek and the integrated cord is retractable for your complete convenience. The steam basket, cooking pan and inner lid all slide out for ease of cleaning. This 5 ½-cup model serves up top-tier results at a remarkably affordable price-point so what are you waiting for? Rounding out, we’ve got another induction model for you with this stainless steel powerhouse finished in muted dark gray. You’ll get all the benefits of induction heating technology and you’ll get the same automatic adjustments fuzzy logic provides along with impeccable consistency. Good for 5 ½ cups of uncooked rice, you’ll get more than double that once it’s ready for sushi and plated up. A design-driven rice cooker from an industry legend at a reasonable price: what’s not to love? By now, you should be quietly confident of making your own sushi at home the easy way. 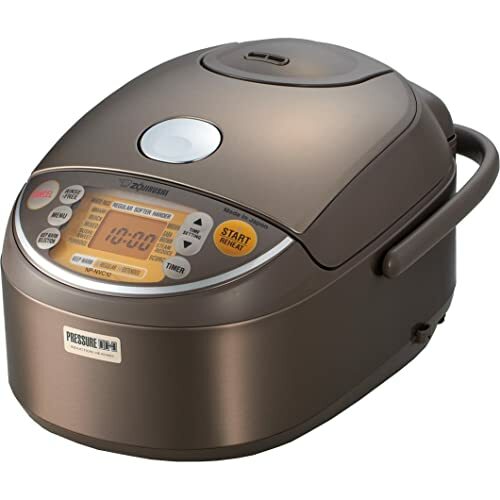 In fact, with a rice cooker, it’s so simple it almost feels like cheating! Make sure to follow the guidelines laid out above and, with a little patience and an hour or so to spare, you can set the foundations for the very finest sushi. And this, as you know, is all about the rice. It’s equally important to take the instructions of your rice cooker into account. This is not the type of job you want to guesstimate. Also, once you’ve got the process dialed in, you can easily replicate every time with perfectly consistent results. Don’t forget, either to rinse the rice thoroughly until no starch remains. We can’t emphasize this strongly enough and it will make the difference between lip-smacking sushi and a mediocre soggy, gloopy mess. Bookmark our blog, follow us on social media and never feel shy about getting in touch if you have any questions or feedback at all. And come back next week. We’re just finishing up some testing of floor lamps so we’ll have our report for you in a few days. Now go and rack up that sushi rice!